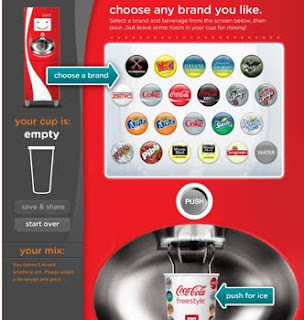 brandflakesforbreakfast: what would coke + sprite + fanta taste like? what would coke + sprite + fanta taste like? Coke just launched an app where you can mix and match the popular Coke brands together to build your own perfectly mixed oddball beverage. And if you're lucky, they'll bring an actual vending machine to your city, to make your custom mixing possible in real life. This is the internet remix culture coming to life, for real. Drink up.